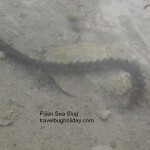 Sea Slugs/WormsI was in Fiji recently. 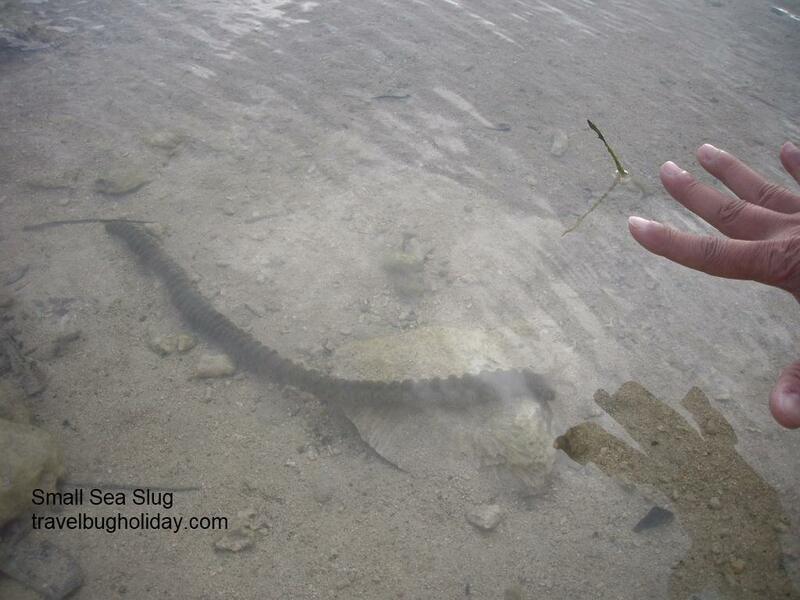 While I was out smoking, I came across a few creatures from the sea such as the sea worms or sea slug as they call them. 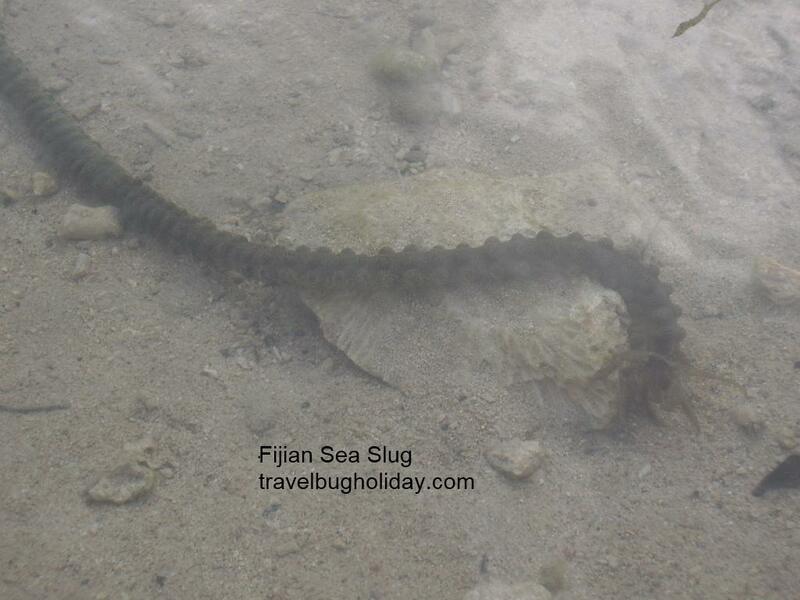 These long brownish creatures lying on the sea bed may look scary but are very harmless. Some are as long as a meter and as fat with diameters as 6cm in diameter. Quite off putting even though they are harmless. I saw some sea anemones especially in the deeper parts. 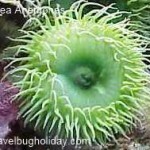 I was told that the sea anemone eats small fish and shrimp. The sea anemone captures its prey with its deadly stinging tentacles. 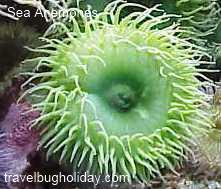 The sea anemone’s mouth and tentacles are located on the top of its body. They can be dangerous but not fatal as I was told. While most sea anemones are relatively harmless to humans a few do contain strong toxic substances producing quite severe effects. They usually spend most of their lives in one place, but some have the ability to move. If they do move, they can only travel three to four inches an hour. Sometimes sea anemones hitch a ride on hermit crabs or decorator crabs. If they do that, the sea anemone can protect the crab and if the crab is a messy eater, the sea anemone can pick up bits of food from the crab and eat it. 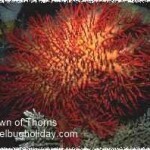 So check to see if there is a crab under your sea anemone whilst you are out there. Some sea anemones just let go of the rock and go float around in the water. 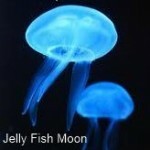 I did notice them and I thought they are different species of jelly fish. 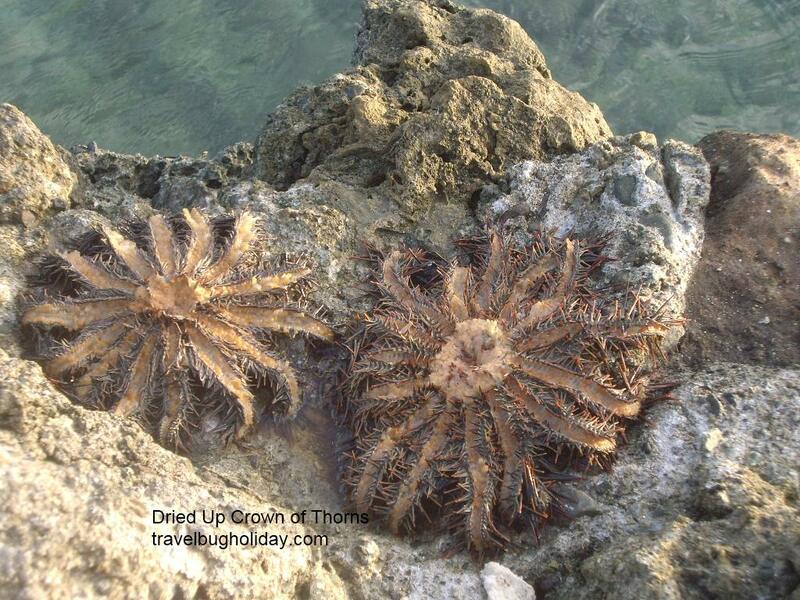 I read that sea anemones reproduce by budding off baby sea anemones. The babies stay connected to the adult until it is old enough to go out on their own. 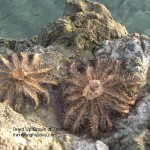 If a sea anemone is torn apart by rocks, then each part becomes a new sea anemone. Interesting …. 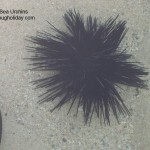 Whilst I was walking along the beach at low tide, I notice this black spiky round ball. I was told not to step on it and it could hurt my foot. 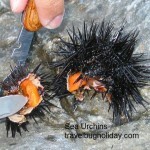 It is apparently the black sea urchins. 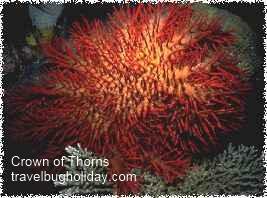 Sea urchins are globe-shaped or mildly flattened animals. They have an outer, solid, skeletal structure called a test, which consists of hundreds of interlocking, spine-bearing, calcareous plates. They are scavengers that mean they feed on algae and animal remains. 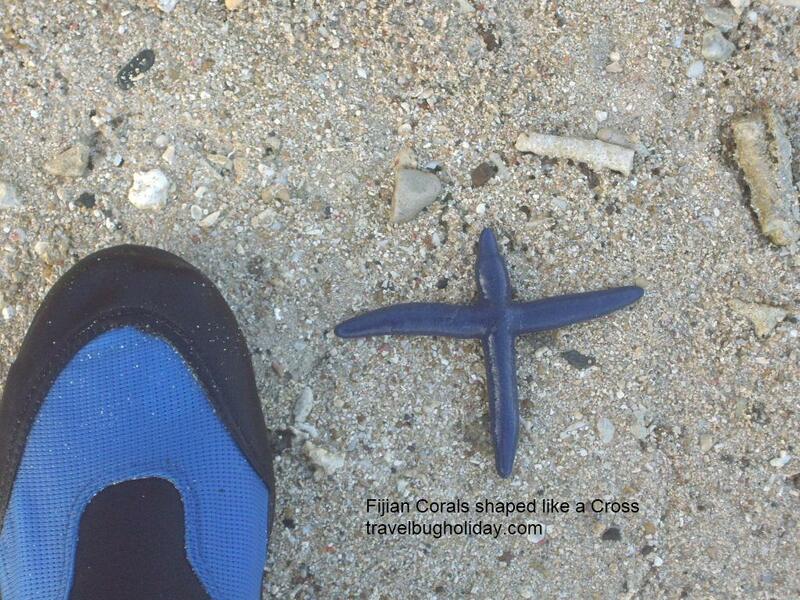 Apparently they are mostly found at low tide levels. If you are swimming and stand on one, its spines may stick into your foot and break off and are know to be very difficult to dig out of your foot thus can cause long-lasting inflammation if not removed – often surgically. 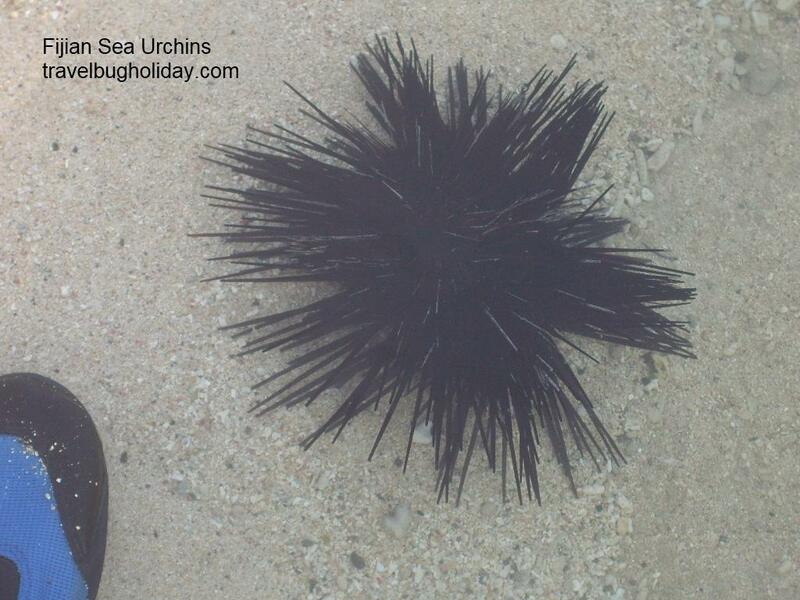 It is just common sense to avoid the sharp black spines of the black sea urchin. There is doubt as to whether venom is also involved. Best not to test this scientific theory out, I reckon. Best to respect the sea creatures! In other parts of the world, people are one of their main predators. 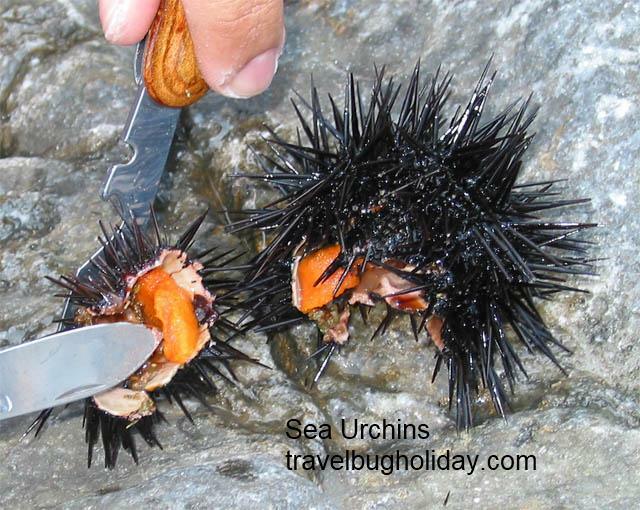 In some parts of the world, sea urchins are believed to be powerful aphrodisiacs. The roe is a prized delicacy in Japan, in islands of the Pacific and in European countries such as France, Italy and Greece. 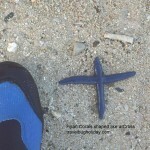 I also notice many sea cucumbers on the shallow floor bed while I was smoking. They looked like soft slimy small long bolsters. Although they are suppose to be one of the safest animals on the reef to touch, (many school children touch these creatures in the zoo) the numerous white tubules, which some eject when irritated, contain a toxin which can cause blindness if it comes into contact with the eyes. This toxin may also be present on the skin so you should wash your hands after handling these creatures (as you do anyway after you touch any animals). I was told to watch out for sea snakes. And was informed that the black & white snakes are very poisonous but will not harm you unless provoked. Lucky I didn’t see any at all. Sea snake venom is more toxic than that of land snakes, however these animals pose little risk. Most are shy and stay away from people, biting only when provoked, and if at all. Even then they tend not to use their venom. 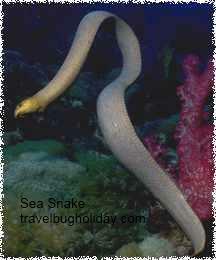 Sea snakes have specialized flattened tails for swimming and have valves over their nostrils which are closed underwater. 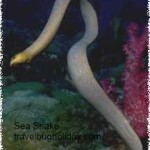 They differ from eels in that they don’t have gill slits and have scales. Due to their need to breathe air, they are usually found in shallow water where they swim about the bottom feeding on fish, fish eggs and eels. Don’t underestimate the size if a snake bites. The truth is that their short fangs (2.5-4.5mm) are adequate to penetrate the skin, and they can open their small mouths wide enough to bite a table top. It is said that even a small snake can bite a man’s thigh. Sea snakes can swallow a fish that is more than twice the diameter of their neck. 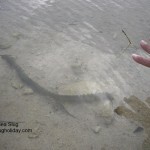 I was lucky to see an eel while out smoking at the shallow end. It looks like a baby moray eel. Eels are lithe swimmers. Most species are less than 3 ft long. Most eels have no scales and are protected by a layer of slippery mucus. Some freshwater eels can absorb oxygen directly from air or water, through their skin. The moray eel has a really powerful bite. 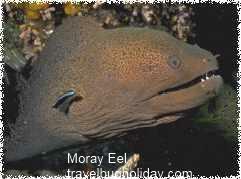 Many moray eels have jaws that open wide so they can swallow large chunks of food. 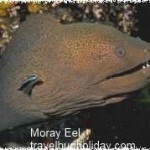 The giant moray eel (the largest of all known eels) can get up to ten feet long. Not sure what kind of eel I saw but it is brownish in colour thus it really blends in the rocks except for its distinct eyes and body. I was not going near it to check it out as I can see it was definitely checking me out, maybe for food!. Looks like a baby moray eel. It was hiding in between the corals and gaps among the rocks. I swam away quite fast indeed. On U-tube, there was a shot of a diver whose thumb was bitten off for good when his thumb was mistaken for food ! So try not to hand fed a moray eel if you can. Might look great for your holiday shots but your photo in hospital might look even better. According to statistics, a number of divers have been bitten by moray eels, their sharp teeth designed to lock on to prey sometimes causing severe damage. These eels are not, by nature, aggressive towards people but can attack if provoked. Many attacks can be blamed on the foolish practice of fish feeding by hand. Accustomed to receiving handouts, some approach divers on sight and can bite a hand which they believe to be holding food. For the same reason divers have also been approached aggressively by potato cod, wrasse, gropers and other fish expecting handouts of food. While some of these may not inflict injuries there is the additional threat that novice divers may be frightened into acting unwisely. Their bites can be poisonous, although the exact toxicity is so farunknown and considered to be rather low. However, secondary infections following any moray bite, as well as the loss of tissue and blood from large moray bites, both constitute a more probable and potentially more serious health risk. 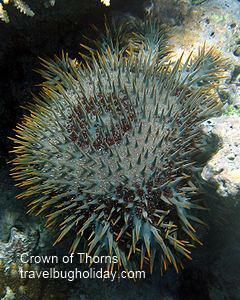 I saw crowns of thorns but they are dead. I was told that the local Fijians fished them out and put them on the rocks hoping the heat from the sun will kill them. However sometimes the waves pick up these creatures and carry them back into the sea. They are certainly very hardy creatures. 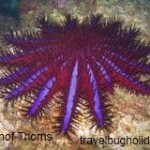 The sharp spines on the sides of the starfish’s limbs resemble thorns and create a crown-like shape, giving the creature its name. 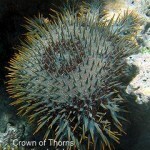 The thorns are very sharp and are capable of piercing through standard wetsuits and other clothing. They are also venomous. 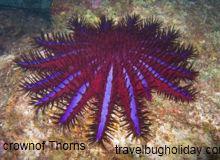 When the crown-of-thorns feed, they release a chemical(through their spine) which is known to attract more starfish to the area. The spine(s) themselves may break off and become embedded inside the diver skin. This can lead to infection, and increased toxicity. 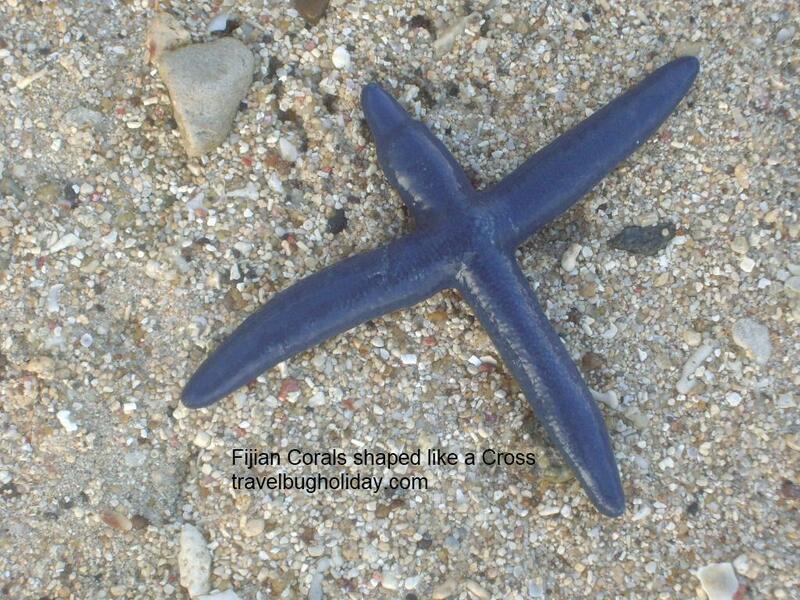 An individual starfish can consume up to 6 square meters (65 sq ft) of living coral reef per year. Luckily didn’t see any stone fishes either. Apparently they are very poisonous s well. 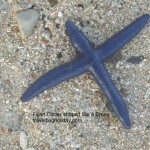 Its main habitat is on coral reefs, near and about rocks, or can be found dormant in the mud or sand. It feeds on small fish and shrimps. The Stone Fish is a brown-greenish in colour (which gives them camouflage) with many venomous spines along its back. The sting causes excruciating pain and a great deal of swelling rapidly develops causing death to tissues. The severity of the symptoms depends on the depth of penetration and the number of spines penetrated. The symptoms of the venom are muscle weakness, temporary paralysis and shock, which may result in death if not treated. My father was bitten by a stone fish when he was out swimming many years ago. He was sweating, feverish and was in deep sock and in pain. I was told that jelly fish here are harmless too. The best news of all, there are no box jelly fish or those nasty irukundji jelly fish.I was told that I will see jellyfish all year round in Fiji waters but during the first quarter of the year they multiply, or bloom, and dense aggregations can be spotted in the water, with many individuals washing up dead on beaches. These aggregations often occur close to land and divers will often encounter them at the reef edge, where they are attacked mercilessly by the fish. 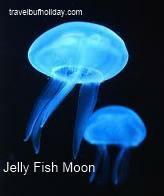 The two most commonly observed species are theCommon or Moon Jelly and the Crown Jelly, neither of which will give any noticeable sting. A 50 year old local told me he had been in the sea all year round and never had any problems with Jelly fish. Looks like we the tourist are very safe!